Indian Creek Youth Camp begins for us today. Although Sunday is the official start date for Clark Sim’s week, we will leave today to get setup. We are expecting upwards of 250 people this week which will likely make it the largest week we have had. I know it will be a great week. Campers from all across Alabama and some from Florida will join us for a week of fun, foolishness and recreation as well as plenty of Bible study and faith building. Located in rural Walker County, Alabama about halfway between Northport and Jasper, the camp is among the nicer camps within the churches of Christ. The young people will come and build friendships that will last forever. It is a blessing to have a small part in that work. I salute Clark for his dedication and the hours of work he puts into the camp week. He is the magic! Keeps us all in your prayers as we travel. We plan to be home Friday afternoon. 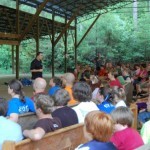 The Indian Creek Youth Camp – ICYC – 2010. Great Job guys!